First voices recommend to demolish the unfinished Berlin Brandenburg International Airport, better known by its acronym BER and to start building a new airport from scratch instead. So advocated by Eurowings’ boss Thorsten Dirks last weekend in a report published by Frankfurter Allgemeine Sonntagszeitung. “My estimation is that this ‘thing’ will be torn down and built completely anew,” the manager is quoted as saying by the newspaper. Dirks’ recommendation is by no means an individual opinion, seen by the growing number of skeptics that have lost faith in the project, doubting that the airport will ever become fully operational. Their disbelief is based on the endless series of flops, failures and fumbling that hang like millstones around the airport’s neck since the foundation stone was laid back in 2006. To describe the many mistakes made from day one until now would fill an entire book. The failed fire protection system, cable ducts that were too narrow and had to be enlarged, escalators that proved to be too short when installed, leaving big gaps between the passenger terminal’s ground floor and the first stair, the relocation of 1,036 trees that were planted in the wrong place near the passenger terminal building, and, and, and. Only days ago, the next mishap followed: the dismantling of 750 six year-old monitors placed in the passenger building areas – without one of them being used a single minute since they were installed. They are technically outdated and no longer compatible with modern software, said BER’s management in justifying the measure. Considering the endless chain of errors and the constantly mounting costs, it is not surprising that the number of people is growing that have lost faith in a positive future of BER, with Eurowings’ CEO Dirks being one of them. 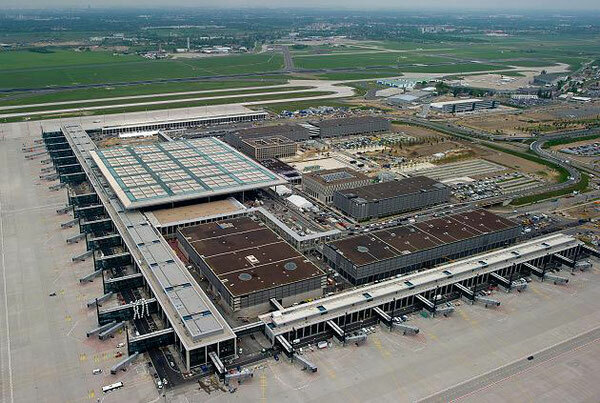 However, in a statement Eurowings’ parent company Lufthansa refuted the manager’s BER presumptions, emphasizing that LH would not support plans to tear down the unfinished BER and advocate to start building an alternative airport somewhere in Berlin’s vicinity. Eurowings Head of Communications Matthias Eberle speaks of an “aggravated reaction” by Dirks who simply wanted to illustrate the extension of the problems BER is facing.